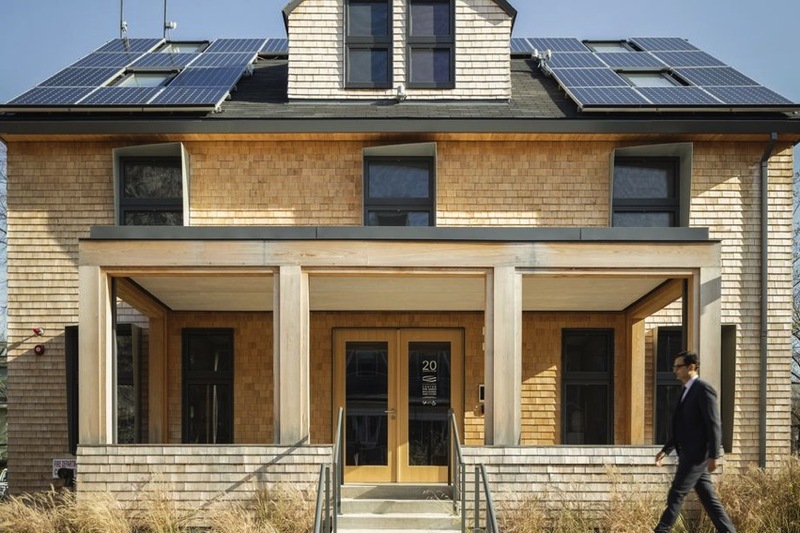 Can a remodeled 1920s home revolutionize green building? « Adafruit Industries – Makers, hackers, artists, designers and engineers! Can a remodeled 1920s home revolutionize green building? New techniques and processes can create super efficient smart homes. But building a new home can also be counter productive green practices. HouseZero shows how old homes can be updated with new tech! A Harvard program to retrofit a campus building and create a living laboratory for energy-efficient architecture officially opens today, aiming to develop techniques and technologies to make the built world more sustainable. The goal of the HouseZero project, to create a building that produces more energy over its lifetime than it uses, is potentially transformative. To accomplish this, the renovated building was designed by the school’s Center for Green Building and Cities (CGBC) with strict performance targets in mind: nearly zero energy for heating and cooling, zero electric lighting during the day, operating with 100 percent natural ventilation, and producing zero carbon emissions. Read more on Curbed and check out Harvard’s Center for Green Buildings and Cities for full details! Comments Off on Can a remodeled 1920s home revolutionize green building?